Will The Alec Baldwin Show soon be gone for good? ABC just announced the low-rated TV show has been postponed and moved to a different night. 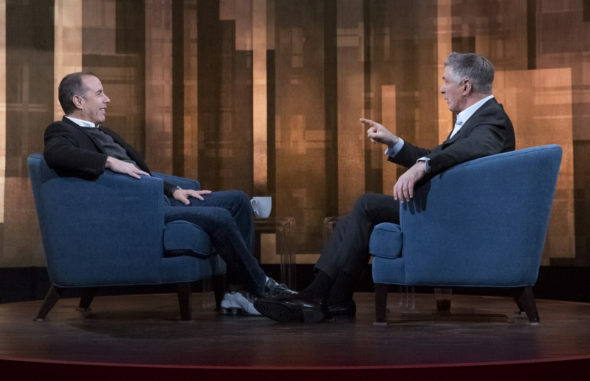 The talk show features Baldwin as he conducts one-on-one interviews with American pop culture luminaries. Previous guests have included Kate McKinnon and Jerry Seinfeld. While it’s unclear if ABC is cancelling The Alec Baldwin Show, the series won’t return until Saturday, December 8th at 10 p.m. ET/PT. So far, the freshman series is averaging a very low 0.31 rating in the 18-49 demo and 1.749 million viewers. With numbers like those, a cancellation after one season seems certain. What do you think? Have you seen The Alec Baldwin Show? Do you think it should be cancelled? More about: ABC TV shows: canceled or renewed?, The Alec Baldwin Show, The Alec Baldwin Show: canceled or renewed? I very much enjoyed this show! Hope it’s not cancelled!